Been itchy to blog for a long time now, and the slow pace in the implementation of the RE and the never ending power supply issues here seem to flame this urge even more. But the semester is busy and blogging has to take the back seat for now. Anyway, this popped up in my 'green stuff' email subscription recently. Apparently, in the name of efficiency and adaptability, some innovative architects in Iran came up with weather defying house design: A house with 90o rotating rooms. How about that for creativity. Rotate your room according to the sun position, season or for functional requirement. 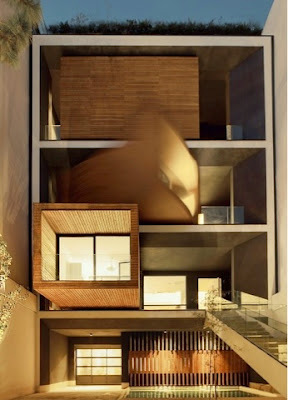 Photo sourced from archdaily. 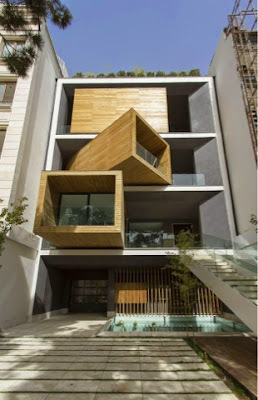 Called the Sharifi-ha House, it is a seven-floor house in Tehran with three rectangular rooms that can rotate up to 90o in accordance with the season. The design was inspired by Iranian mansions that had separate living rooms for both summer and winter. When extended outward, the spaces offer each floor its own terrace. The rooms serve a functional purpose as well - the lowest is a breakfast area, the middle a home office and the top was planned as a guest room. The owner is importing CNC and other similar industrial German machines, and the structural system is to be fabricated in Germany. This custom CNC-machined mechanisms functions like the turntables used at auto shows. Source: If you are interested, there is extensive details here at archdaily.